Oyako Donburi is Chicken & Egg on Rice. Oyako means 'mother and daughter', so that's very appropriate, don't you think? This is a donburi bowl. It's got rice on the bottom. And the meat and vegetables on top. The juices soak into the rice and make it especially flavorful. At our house, the boys eat it on a plate, like okazu. The girls eat it in a bowl. Smash one block of tofu and set aside. I'm using tofu instead of using so many eggs. The tofu will give the mixture the same consistency and taste, without the cholesterol of a lot of eggs. Saute the garlic and onions in a little bit of oil. I'm sautéing the chicken in another pan because I'm not eating meat, but my husband does, so I'm going to add the meat at the end, on top. If you're cooking for omnivores, add the chicken after the onions & garlic. Add the tofu and mushrooms. Add one package of dashi. 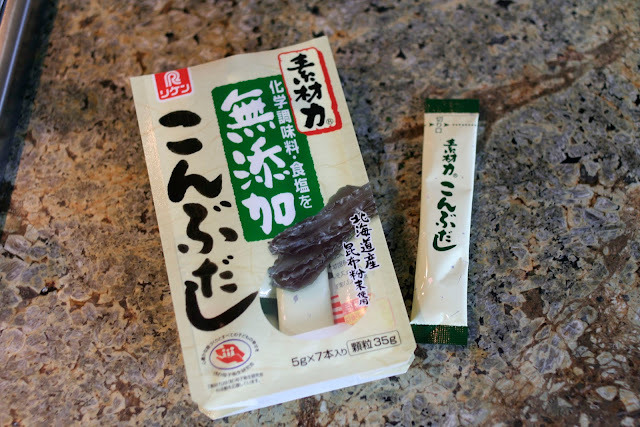 I just found out that this kombu dashi is sold online at Mitsuwa Market. I prefer this kind--they also make bonito dashi and iriko dashi--because there's no MSG (chemical additives/flavor enhancers) or added salt. Just Hokkaido konbu. Cover and simmer for just a minute or so. In Japanese cooking, you're supposed to mix them gently, not like you're going to make scrambled eggs. Cook the spinach until it's just wilted. When the mixture starts to boil, add the eggs. Wait about 30 seconds or so and then stir them gently. Cover and cook on low heat until they're just set and still soft. Adjust the seasonings to your liking. If it's too strong, it's okay to add a little water. That will just make more broth. You're going to put it over rice, and the rice is going to soak up the flavorings. What I like about this dish is the sweet egg. This one is the vegetarian version, without the chicken. So if oyako donburi is mother & daughter, chicken & egg, what is it called when it's only egg? And on a plate? Egg & Spinach on a plate? I'm sorry to say I don't know much Japanese. I should have paid more attention in Japanese school! I went to Japanese language school for about nine years. 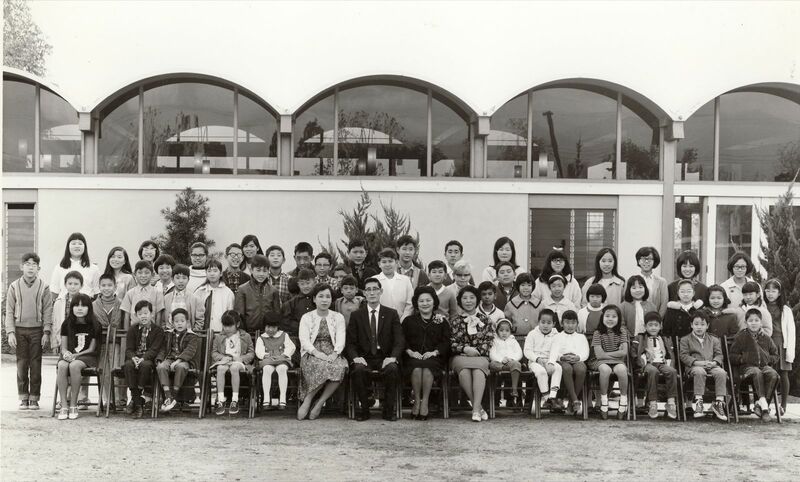 This is the Japanese school I attended, that's me in the back row, second from the end on the right. I must be about 15 in this picture. My four grandparents were born in Japan, all four from Fukuoka, my parents were born here in the US. They spoke Japanese, but my parents only spoke Japanese when they didn't want us kids to know what they were talking about. We spoke English at home, but my parents spoke Japanese to their parents. The sound of the Japanese language is familiar to me, but I don't understand it. In Japanese school, I learned how to read and write hiragana and katakana--I would say they're like two forms of the Japanese alphabet, or, the sounds of the Japanese language. I learned to read at, maybe, second or third grade level, learning a few kanji. Basically, I'm sorry to say, I was a dunce in Japanese. Back then, the place that I grew up was a different place than it is today. When I was in school, there were but a few Asians families--all of Japanese ancestry--and we all knew one another. I knew only one kid in Japanese school that spoke Japanese at home, and he was a recent immigrant and born there. Nowadays, there are a lot of Asian and Hispanic nationals in the area I live in, not too far from where I grew up. Their families seem to be what I imagine my parents' families were like, the kids interpreting for the parents to their teachers at school because their parents don't speak English. I didn't understand the situation until I went to Japan and needed someone to interpret for me, and after only a week of being in Japan, I gravitated to those that spoke English, just to hear the familiar sounds of my native language. After I'd traveled to Japan is when I started to wish I had studied in Japanese school, but instead, spent the majority of those years, every Saturday from nine to noon, fooling around, gossiping with my friends, and trying to learn the latest dance steps. We didn't learn Japanese, but the time we spent together fostered long-lasting friendships. Those girls in the back row with me are still some of my closest friends. oOo...I think I know what I'm making for lunch...!!! Thanks, Karolyn! And thank you for sharing the story and the photograph! I didn't go to "J school" and my parents also only spoke a little Ja-panglish (?!!) when they didn't want us to know what they were talking about! Your Japanese recipes have great for me! I grew up with spaghetti, meatloaf, swiss steak, etc. and only once in a while had something kind of Japanese. LOL, thanks for teaching me! After looking at your recipe, I hopped over to Tamaya and had a big bowl of ramen and a smaller bowl of donburi. Nothing else was going to hit the spot, feeling very stuffed and satisfied at the moment. Comfort food! I love your story and photo. When we came to this country in '67, we lived in LA. My sister and I were the only two Asians in the entire school. All the other kids were fascinated, they had never seen anything like us. So many years ago, such a different time. that picture is amazing! like a game of where's waldo. i can find at least 5 or 6 people i recognize. is that margaret next to you? is my mom's brother mark in there? i love oyakodon. it's such comfort food. i think i'll make it tonight if i remember to buy some more eggs (extra large brown eggs for $1.89/doz, i should make oyakodon every night!). tofu is wonderful, but it can never compare to the silky sweet richness of eggs. i think maybe the cholesterol slows blood flow to the brain, doubling the heavenly effects of eating so many eggs.